MANILA, Philippines - The official results, list of passers, top examinees, performance of schools and other important announcements for November 2018 Civil Engineer board exams are released by the Professional Regulation Commission (PRC) Board of Civil Engineering four (4) working days after the board exams. 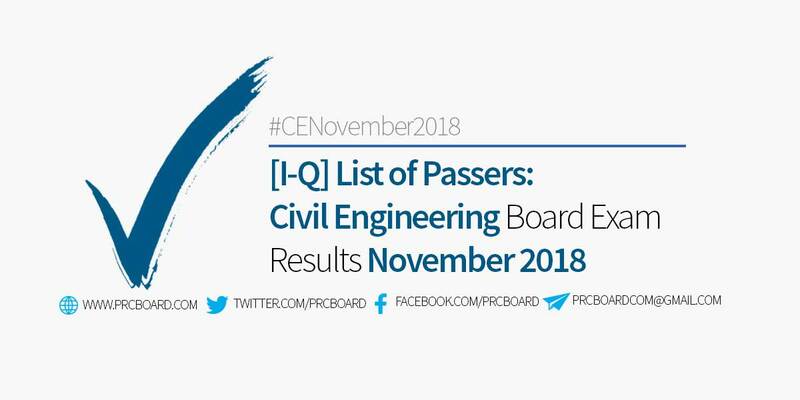 Below is the list of passers for November 2018 Civil Engineering (CE) board exams with surnames starting with letters I-Q. Hopefully It's within the day. God bless you all. Cant wait for the result, its killing me more than my nephew who took the exam. What time will the results be released? Sooooooo looking forward to it.. and I'm not even the one who took the exam. Dying to see the results. Goodluck Andre!!!! Good luck to all !!! God bless! God bless to all of us who took civil board exam..
Im having gastric problems cause by mixed feelings of anxiety, excitement & nervous. Just show the results admin before it squirmed out my internal organs. Been checking this site since yesterday even though I'm not the one who took the exam...I'm so excited for the result! God bless to all who took the exam! God bless Alexa Mae! We love you! good luck brother Roy Ian! UE! Claiming God's victory for my friends 😘😘😘😘 in Jesus name! Haay naku! Paas!!!! Patapos na ang november 15 wala pa rin ang result!! Sobrang kaba na talaga!!! Congrats in Advance to Ms. Jocelyn Pineda!! Lord hear our prayer😇🙏🙏...Kuya papasa ka tiwala lang...fighting. God Bless to all..
anong oras daw po ang release ng results? God's favor be with you Malonzo, Aaron Serrano. In Jesus' name, amen. Well, I'm just hoping for the best to each and everyone of you. Either you get it or not, still, thank the LORD. He has a purpose for you'll. Bakit ang tagal? kahit rason lang po kung ba't sobrang tagal. parati na lang. I'm so proud of you, I love you nak.